Don't know where to start? MDNA Cloud can help. 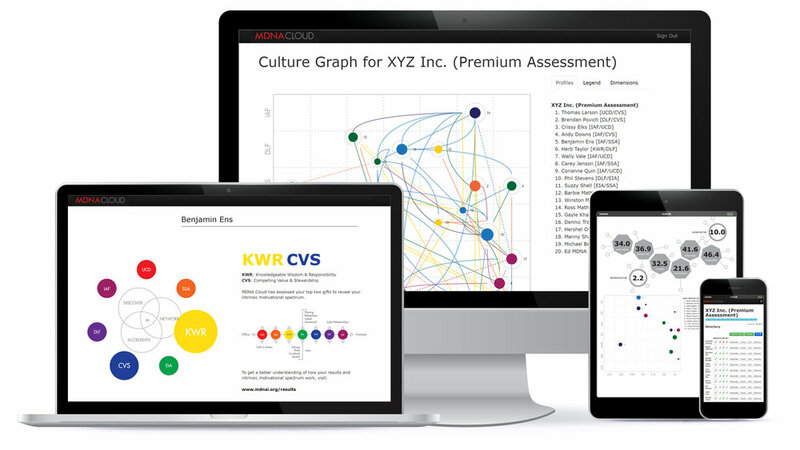 MDNA Cloud is a software platform that measures culture and employee engagement. Organizations know that culture is important for strategic growth but don't know how or where to start. MDNA is deployed through a two-part assessment and measures six dimensions of culture along with five dimensions of employee engagement including social engagement, confidence in change and self determination. MDNA Cloud is also the foundation for helping companies build their external brand by building their culture. In addition to the culture data above, we can identify an organization's unique differentiator and develop a message that will resonate internally and externally. Bring It To Your Organization. MDNA Cloud starts with employees. It identifies individuals' primary and secondary MDNA Gifts. It also measures six dimensions of culture. 1. Tell us about your culture needs. Want to improve your culture? Create an environment where employees motivate themselves? Identify hidden gems in your culture to build your brand? We can help. Let's start a conversation. 2. We send the assessment. Employees take the basic assessment which measures their intrinsic motivation. Every employee receives a personal report. Any individual may also take the basic assessment for free. It takes about 20 - 30 minutes. Once the basic assessment is complete, employees are automatically sent the premium assessment which asks them a variety of questions related to culture, change and engagement. This second part takes about 30 - 45 minutes. 3. Review results and debrief. Once all employees have taken the assessment we'll schedule a 2-hour call to review the results. We'll also advise on next best steps for your specific organization. MDNA Cloud starts with individuals and employees and measures your intrinsic motivations. Take Part 1 of the Assessment and identify your primary and secondary MDNA Gifts. Free. Instant Sign-Up. Immediate Results. Taken by over 4,600 individuals representing every continent. Users report a 94.40% accuracy rating. Used by over 84 companies for employee engagement and analytics with a high degree of success. In MDNA 3.0, we expanded MDNA to define true joy, which is "knowing you are in the right place at the right time with the right people doing the right thing." The MDNA process that Liz employed at the beginning helped define how, as individuals, we were wired together as a team...We now use MDNA as a litmus test for all incoming employees; our hiring process is amazing because of it. Interested in bringing MDNA Cloud to your organization?